The Patriots face the Cowboys this Sunday. Let's face it, not many in Patriots Nation are fearful of this Sunday's game against the Dallas Cowboys. Who can blame them? The Patriots have been steamrolling teams left and right by whatever means the Patriots feel like imposing upon their opponents. On top of that, the Cowboys could be without their starting quarterback (Romo), wide receiver (Dez), defensive end (Gregory), running back (Dunbar), and linebacker (Lee). So how could the Cowboys win this game? There are a few possibilities. First of all, the Patriots will need to overcome that mental opponent that is the bye week. Often times players go back home, go see their college team play, or go on a vacation to get their mind off of football. Players may not stay up with their conditioning, or decide to indulge a bit. With a week of rest away from football, mindsets could change and make players lethargic with the relaxation that came during the week. That being said, I highly doubt many, if any, Patriots players will come out of this bye week worse than what they went into it being. With such a disciplined team full of leaders capable of keeping players on track, it is unlikely that the Patriots will come out of the bye distracted or flat. So the Cowboys shouldn't rely on that happening. Another possibility is the Cowboys defense getting to Tom Brady and stuffing the run game. The Cowboys will be getting back this week both DE Greg Hardy and LB Rolando McClain, who were both dominant players at times in their careers. If Sean Lee is able to clear the concussion protocol and play, he could be a huge factor for the Cowboys as their best defensive player. Hardy will be a great test for Solder and Cannon, and he has shown that he can get after the quarterback. Lee and McClain are great tacklers and know how to find the ball. Using play action and short passing routes may be the best way to counter the Cowboys defense. By going into shotgun and getting the ball out quickly, the Patriots should mitigate whatever pass rush the Cowboys may bring. By targeting mismatches in the secondary and out of the backfield the Patriots offense should do just fine. 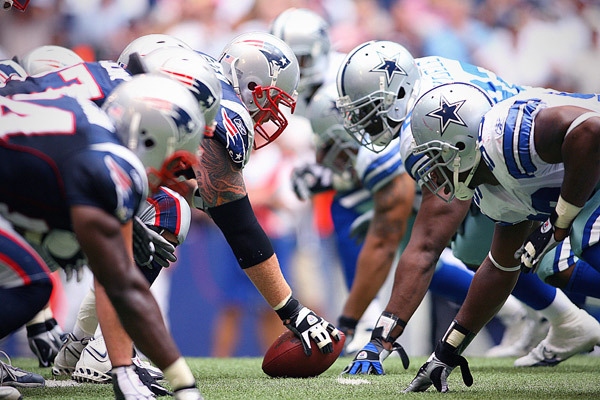 The best chance the Cowboys have is to pound the ball against the Patriots. The Cowboys offensive line is, without a doubt, one of the most talented in the NFL, even if the running backs running behind them haven't lived up to the standard that Demarco Murray set last year. The best way to stop Tom Brady has always been keeping him off the field, and that is done by prolonged drives with numerous plays and a lot of time of possession. With Lance Dunbar out with a torn ACL and MCL, the Cowboys will likely turn to Joseph Randle, Darren McFadden, and Christine Michael to provide a spark out of the backfield. Though, none of those running backs offer the same dynamic playmaking that Dunbar had been giving the Cowboys out of the backfield as a runner and pass option. The Patriots have planned for the Cowboys running attack by heavily investing in the front seven by trading for Jon Bostic and Akiem Hicks. Both should be used to assist in stopping the run. With Brandon Weeden set to start against the Patriots, and the Cowboys best passing options being Terrance Williams and Jason Witten, the Patriots could load the box and force Weeden to beat them through the air. When all is said and done, it is more probable than not that the Patriots will win this game, but the Cowboys could put up a fight. The Patriots have prepared for this Cowboys team and should have the pieces in place to have a complete game plan against them.